Starved Rock Yacht Club – Where friends become family, since 1934. Where friends become family, since 1934. Congratulations on making it halfway through the off-season! 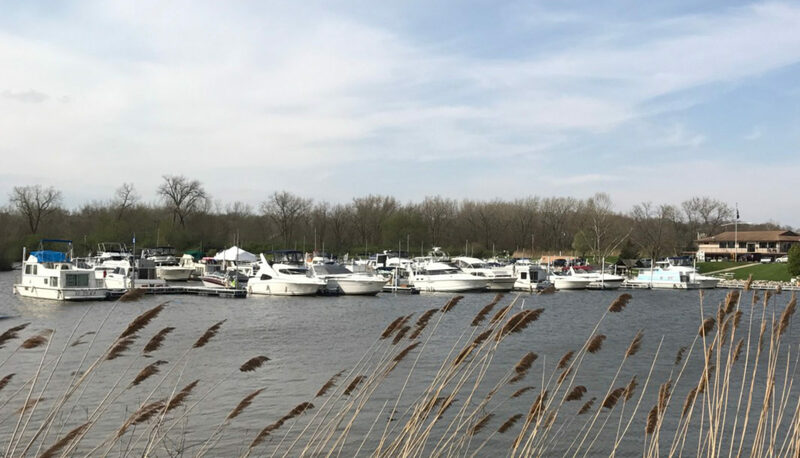 As you make your plans for spring and summer boating, we invite you to consider SRYC, a friendly, laid-back boating club on the Illinois River in Ottawa. We have open slips ready for new members in the 2019 season. No matter what size boat you own, from a small fishing boat or PWC to a floating condo, you are welcome at SRYC. Visit our special place on the river. Look for membership costs and details here. Thanks to Michelle Collins and Pat Radochonski for the photos. At SRYC’s December meeting, two members received special honors. Commodore Eric Jensen presented Bernie Sexton, member since 1988, with a special service award. Bernie served the club in a leadership capacity for 28 years, including four years as Commodore. Bernie’s current term as Rear Commodore expires at the end of the year. Kevin Kwiat was awarded the Boater of the Year Award for 2018 in recognition of his tireless effort leading this year’s harbor dredging project. Kevin researched the problem, found an appropriate solution and brought it to the Board. Following Board approval, Kevin procured the equipment, tested it and put it to work. He even trained several members to operate the dredge, expanding the circle of helpers. Congratulations, Kevin, on a well-deserved award. all-day Spring Launch – Boats In! Spring Launch – Boats In! Continue reading "Spring Launch – Boats In!" Continue reading "85th Anniversary Dinner"
An SRYC tradition. Celebrate the first summer holiday weekend by serving a beverage and snack on your dock and sampling all the others. Good times! Continue reading "2019 Wide-Waters Blessing of the Fleet"
Continue reading "Ron Robb Special Peoples Cruise"
Monthly member meeting for June, 2019.